In celebration of FiberScene’s 10th Anniversary, we explore some of the recent work of the artists who inspired our website. We reaffirm our strong commitment to them by showcasing and promoting the work of San Francisco Bay Area Fiber Artists and gratefully acknowledge their continued support. Beginning in January 2009 with Virginia Davis’ gorgeous and cerebral work and followed by Ana Lisa Hedstrom’s enchanting shibori wall pieces, we are offering 6-8 week solo Gallery shows. This show highlights the work of Adela Akers. Akers uses linen, horse hair, ink and recycled metal foil as the primary materials for her large-scale woven wall pieces. Over the past several years, she has developed a unique method of working with these distinctive materials to form complex, sophisticated textiles that evoke her surroundings in the Napa Valley. 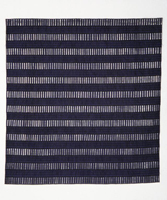 At first glance, Akers’ weavings might seem form-based and stylized in the manner of modern artists like Anni Albers and Frank Stella. Indeed, her work utilizes grids and geometric shapes in this way, and her most compelling pieces rely on a repetitive structure. But upon closer inspection, one sees a more intimate side of Akers’ work - horse hair is subtly blended into linen, revealing itself in long trailing strands that brush across the glimmering surfaces. Metallic golds and bronzes, scavenged from nearby wineries, are thoughtfully stitched to the surface making long horizontal marks peppered with black threads. Akers also paints large patterns on the finished surfaces with ink, and her skilled use of line weight adds to their commanding presence. Akers’ steadfast attention to detail makes these pieces fascinating to see on an intimate scale. Where some artists approach form as simply as possible, Akers takes it one step further by adding complex textures, subtly shifting colors and unusual materials. Akers’ work equally balances the themes of industrial life and the natural world. 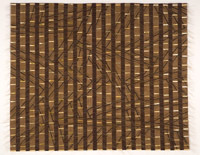 Each wall hanging contains references to man’s modernist sensibilities through its formal structure and orderly decoration with shiny foils, while a wild, untamed (and untameable) side of nature also emerges in the form of long, wavering strands of hair or in branchlike patterns woven into the linen. We hope you enjoy Adela Akers’ marvelous work as much as we do!